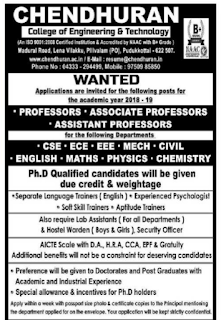 Chendhuran College of Engineering & Technology, Pudukkottai has advertised in THE HINDU newspaper for recruitment of Professor, Associate Professor, Assistant Professor jobs vacancies. Interested and eligible job aspirants are requested to apply with in one week. Check out further more details below. Chendhuran College of Engineering and Technology is affiliated to Anna University, Chennai and in the short period since it was started, has grown into an institution that provides excellent technical education, while keeping the overall growth and development of the students in mind. Both academic and non-academic activities are given equal importance. Accomplished staff, quality driven, innovation and superior accountability are the reasons for the students achievements both in academic and co-curricular activities. The College is committed to equip future graduates with the knowledge and skills necessary to work and excel in the ever more competitive global environment. The Institution offers courses in 6 Undergraduate and 5 Postgraduate Programmes. It has excellent infrastructural facilities including contemporary laboratories, library, Internet and other general amenities. 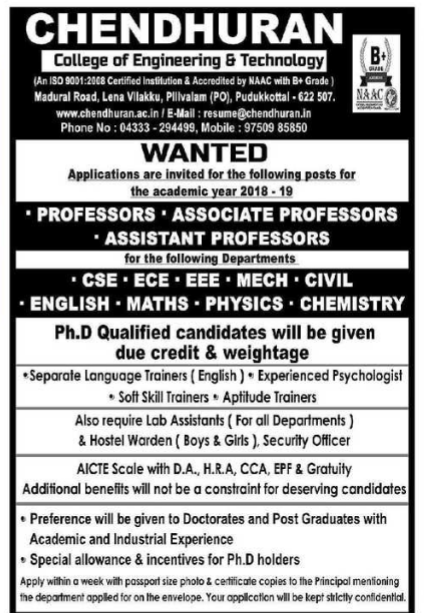 Ph.D qualified candidates will be given due credit and weightage. Additional benefits will not be a constraint for deserving candidates. How to apply: Interested and eligible candidates can apply with in one week, with passport size photo & certificate copies to the principal. Your application will be kept strictly confidential.